Sometimes our fire alarms go off when there is no danger present! We’ve all experienced it. We are sound asleep when the fire alarm goes off. We run around in a panic concerned about a fire to find out that it was a false fire alarm. In fact, there are some common reasons that lead to our fire alarms going off when there is no fire danger to be concerned about. Find yourself being a culinary mastermind in the kitchen? No matter how careful we can be creating delicious creations in our kitchens, we may sometimes find food falling on the stove and getting burnt. The smell wafting through our homes and into our smoke detectors. As a result, our fire alarm is likely to sense smoke and activate. If you own a home with a fireplace, congratulations. Having a fireplace is a great way to keep you and your family warm during those cold winter nights. However, if you are not properly maintaining your chimney, you may be carelessly creating more harm in your home. When your chimney isn’t properly cleaned, you could end up sending smoke into your home which will inevitably set off any fire alarms that you have. When there is a high level of humidity in the air, your fire alarms may go off. In fact, because of the density of the intense particles of moisture in the air your fire alarm is almost always triggered to go off. 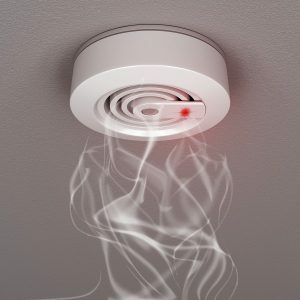 Unfortunately, smoke detectors are unable to distinguish between smoke particles and high humidity particles in the air. Sometimes it’s the strangest things that cause your fire alarm to go off when there is no fire in sight. In fact, insects are able to crawl into the fire alarm which then simultaneously triggers the alarm to be set off. Therefore, it is important to check the inside of the fire alarm for any creepy crawly critters that have made their way in there. This entry was posted on Thursday, April 6th, 2017 at 11:25 am. Both comments and pings are currently closed.